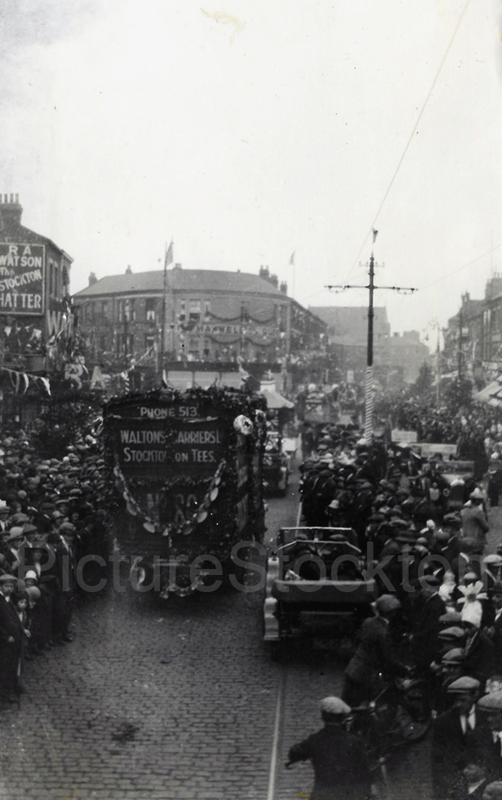 This photograph taken from my grandparents scrapbook gives a view of Stockton High Street during the Peace Day celebrations in 1919. What a great picture! I’m sure some of my relatives are there. How History repeats itself. My Dad living in Beaconsfield Street Norton never spoke about the War he was too young to go to but he did speak about the Celebrations when he was just Sixteen at the end of it. I had just turned 16 when the war in Europe finished then three months later the war in Asia the feeling of euphoria was something that you never forget. He told me of parades street parties bonfires and the dancing around them, I saw exactly the same things. Hidden hoards of food came out of hiding holes where mothers fearing for the future had stored them just in case, we stuffed ourselves after the strict rationing of war time thinking at last things will get better. “Err no” they actually got worse, we were not to know that at the time. I understand those crowds letting their hair down as we all did, the picture shows Maxwells corner and decorated trams we had progressed to Buses. We went into Stockton to dance, every Dance Hall had opened their doors and let the crowds in it was impossible to dance so we sang instead and still singing as we all walked back to Norton, boys and girls arm in arm and to the huge bonfire at the top of Beaconsfield Street, we danced around the fire and i kissed more girls than I knew lived in the area so some must have been kissed more than once. That total feeling of being uplifted I still remember as if yesterday, had we known what was coming we may well have just continued with the parties and opted out of the moving on bit.